Madison, Wisconsin. Find parking ramps near the Wisconsin Historical Society. 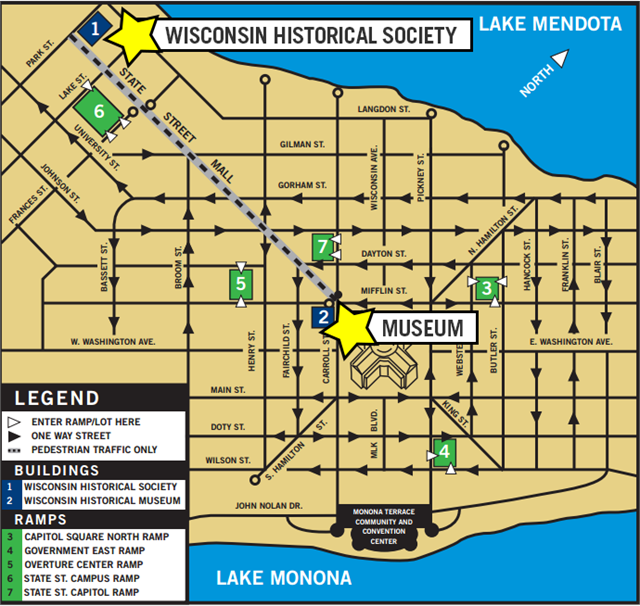 See options in our See a printable parking ramp map (PDF, 200 KB) of parking options close to the Wisconsin Historical Society and Wisconsin Historical Museum. 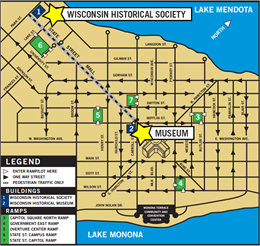 The Wisconsin Historical Society's headquarters building (map) is located on Library Mall of the University of Wisconsin-Madison campus. Visitors with limited mobility may be dropped off and picked up in the small staff parking lot on the corner of Park and Langdon Streets. See more parking options and accessibility information below to help you plan your visit. Many city lots and downtown metered street parking become filled early in the morning, especially during special events. UW parking lots near the Society have metered parking for up to two hours. UW Lot #1 (next to the Memorial Union) is closed for construction. UW Lot #6 (under the Helen C. White Library) is the closest UW parking garage. It is located on the northwest corner of Observatory Drive and North Park Street. Enter the garage from North Park Street. Some meters are available during the day. More meters are available after 5 pm and on Saturdays. All day parking in UW lots requires a permit. To arrange for a visitor's permit, contact UW Transportation Services. Reserved daily permit parking can be purchased up to a week ahead of time. The UW campus also offers shuttle service to the Society from other outlaying UW permit lots. View the UW campus parking map for additional information (requires Flash player). The current Memorial Union construction projects may disrupt traffic and some parking options. See the current UW campus street closures and detours map. Several Madison city buses stop one block from the Society headquarters building. Park and ride lots allow drivers to park for free and ride city buses to various Madison destinations. Contact Madison Metro (608-266-4466) for scheduling and route information. Badger Coaches (608-255-6771) runs 7 buses daily to and from Milwaukee Mitchell Field airport. A one-way trip takes approximately 2.5 hours and visitors arrive on Langdon Street at Memorial Union, just a few steps from the Society's door. If you have a group of 10 or more, you may want to consider planning your trip with a charter bus. First Student Charter Bus Rental (1-866-953-8747) can help your group travel a few blocks or hundreds of miles. GoGo Charters (1-855-826-6770) can handle any of your charter bus reservations in Madison, Wisconsin. They offer a variety of high-quality options that will make your travel experience smooth and seamless. Whether you're looking to take a big group or meet up with some friends, a multitude of options is at your disposal. Total Charter Bus (1-866-303-2594) Enhance your group tour through historic Wisconsin with Total Charter Bus. Our team is at your service 24/7, ready to provide luxury ground transportation to the city of Madison from any location in the United States. With access to thousands of buses, we can service groups of any size; and get you there on time and in comfort. Call us at 1-866-303-2594 to secure a quote today. The MegaBus (1-877-462-6342) offers daily express bus service with stops in major cities in Wisconsin, Minnesota, Illinois and more. The Van Galder Bus Co. (608-257-5593) runs 14 buses daily to and from Chicago O'Hare airport. A one-way trip takes approximately 3 hours and visitors arrive on Langdon Street at Memorial Union, just a few steps from the Society's door.